The Dream Golf Club in West Branch is a 4-star (Golf Digest) Jeff Gorney design cut through North-Central Michigan hardwoods along a spectacular rolling terrain. Large, mildly undulating bent grass greens provide some of the best putting surfaces in the state, and compliment the sculpted tee areas, high quality bunkers, and manicured fairways to make this course a memorable golf experience. The Dream is a family owned and operated golf property providing great, friendly service and together with the Nightmare (opened in 2003) establishes a wonderful one two punch for the area. This is a destination in itself - with play on both courses in the same day available for $125 per player during the 2004 season, and is also a wonderful way to begin or end a golf trip up north. A huge putting green that fronts the clubhouse provides golfers with a good indication of the type of conditioning present from tee to green. Adjacent is a large grass range with target areas. The clubhouse at the Dream includes the basics - a small but efficient pro shop, and a grill that features hot and cold sandwiches, beverages and snacks. Neither course has a liquor license, but the owners here are cordial enough to allow golfers to bring their own beer. Coolers are available for such purposes! On course golfers will find the Kirby marking system in place, with yardages posted every 25 yards from 200 to 75 yards away, and pin placements are indicated by color coded flags. Each tee area also has blocks with measurements to the center of the green. Scratch golfers will find the back tees challenging, as they measure 7000 yards with a 135 slope. The white tees measure 6392/124 slope, and the golds are very playable with a 119 slope and 5769 yards. The forward tees are play to 5282 yards with a 117 slope. The front nine is a couple of hundred yards longer, but we found the back to provide more challenges, in the form of tighter fairways highlighted by some extremely rolling terrain. Throughout, players will find the green complexes conducive to scoring, with plenty of room around most of the putting surfaces, for slightly offline approaches. The opening hole is a good one - a score-able par five from an elevated tee that doglegs to the right past the left fairway trap. Played as a 3 shot hole, golfers can lay up to the right of the sand bunker to the left about 100 yards out, leaving a simple approach. Number two plays uphill with a bunker on the right about 155 yards from the green providing the greatest obstacle to par. There is lots of room greenside here. A very wide fairway off the tee on three narrows on the approach. 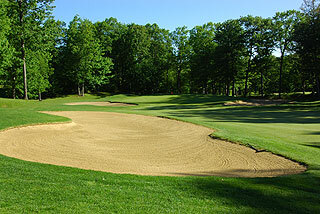 A huge sand bunker in front and slopes that drop off quickly to the left and right create some difficult up and down situations. 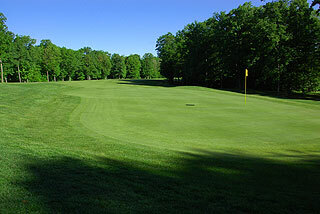 The fourth presents a wide, undulating fairway that bends right to left making this 464 yard par four play even longer. The downhill approach demands some accuracy, as the right side is well guarded by a large trap and water comes into play across the cart path along the left. The first par three of the day is a beauty - and demands a tee shot that reaches the green...anything hitting the forward bank will roll back into the hazard. Long is better than short here. Six and seven are very playable par fours that feature wide fairways, and are followed by a long par three that plays from a variety of sculpted tees and provides adequate bail out room greenside past the bunker. 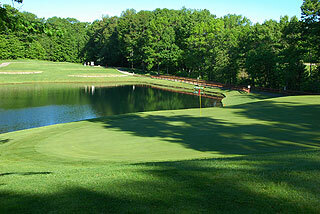 The front finishes with the course's # 1 handicap, a 3-shot par five. The fairway bends to the left and also slopes in that direction. 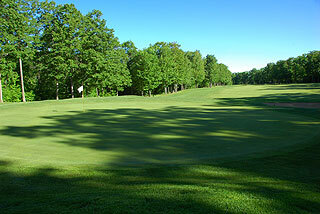 From 150 yards away (near the right fairway trap) the terrain leads downhill to a well bunkered putting complex. A lay up near this trap will provide for a simple approach, creating a good scoring opportunity. The back side begins with dogleg left defined by thick forest, with the 100-125 area just right of the fairway bunker providing a good location from which to approach the green. Anything landing past the trap may find an uneven lie in the depression that fronts the putting surface. The narrow fairway on eleven is shaped to funnel slightly offline tee shots towards the center, with a drive aimed just left of the cart path providing the preferred direction. Forget about the tree! There is little room for error on the approach, as the green is well bunkered and trees immediately in back equal trouble for anything hit long. On twelve an extra club or two is necessary to reach the green, with long being an option as 20 yards of grass rests between the putting surface and the forest. Thirteen doglegs left near the 175 yard marker but slopes towards that side, leaving the right center as the preferred landing area. The long and narrow green creates a tough approach. Fourteen bends in the opposite direction, again near the 175 yard area. 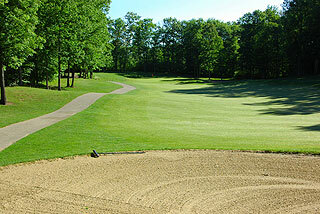 A tee shot placed right of the fairway bunker from 150 yards in will leave a simple second shot. 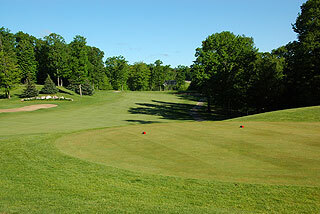 The dogleg to the right is sharper than the image on the scorecard indicates on 15, which is a mid-range par four from an elevated tee that plays back uphill along a fairway, with extreme undulations past the 150 marker. A huge (blind) bunker rests behind the plateaued green. Sixteen presents a wide rolling fairway that bends left and plays uphill, and is followed by a score-able three par with a large bunker guarding the right side. The finishing hole is a beautiful par four from an elevated tee that features 2 huge bunkers that squeeze the fairway, providing sections of landing areas from 200 to 125 yards in. 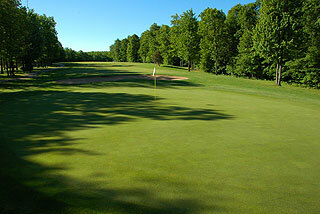 There are not many even lies on this extremely undulating fairway - and the putting surface mimics this terrain. The par fours and fives on this side feature some challenging lies amongst the many depressions and valleys present on the fairways and greenside. What a beautiful layout! On our visit, we toured the Dream prior to a tournament and the course was in most excellent condition. 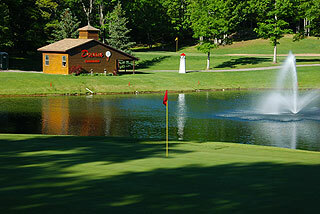 Darcy has been in charge of operations here from the property's inception, and he and his staff do a fantastic job of providing a casual, private club atmosphere, and of making golfers feel like this is their course. Everything here is simple and beautiful - from the clubhouse to the landscaping to the natural lay of the land - which incorporates features one expects from first class northern Michigan layouts. Highly recommended! Visit our informational page for the Dream, with a link to their website - by clicking here.